Any regular readers will know that we tend to prefer to seek out local traders and businesses rather than diving into the nearest bland characterless chain. 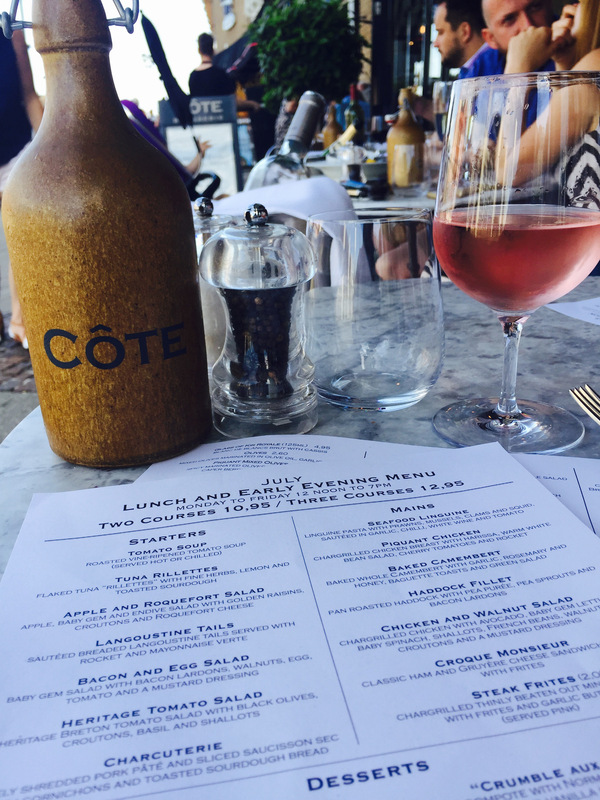 However, as always, there are a few exceptions to the rule and certain chains, such as the French inspired Côte Brasserie, are just too good to miss out on. 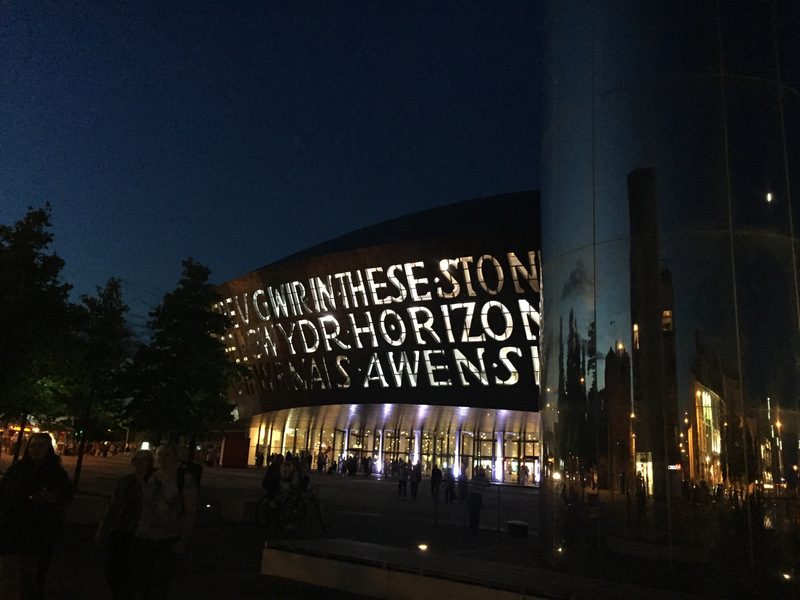 The Côte Brasserie at Cardiff Bay is ideally situated across from the Wales Millennium Centre (WMC) for a spot of pre-theatre dining. Their set menu of £10.95 for two courses or £12.95 for three, for a mid-week dinner before 7p.m. has plenty of choice and is excellent value. The interior of Côte Brasserie is stylishly decorated in the typical elegant Parisian style with dark wood, marble tables and wall to wall mirrors, all in all very chic. 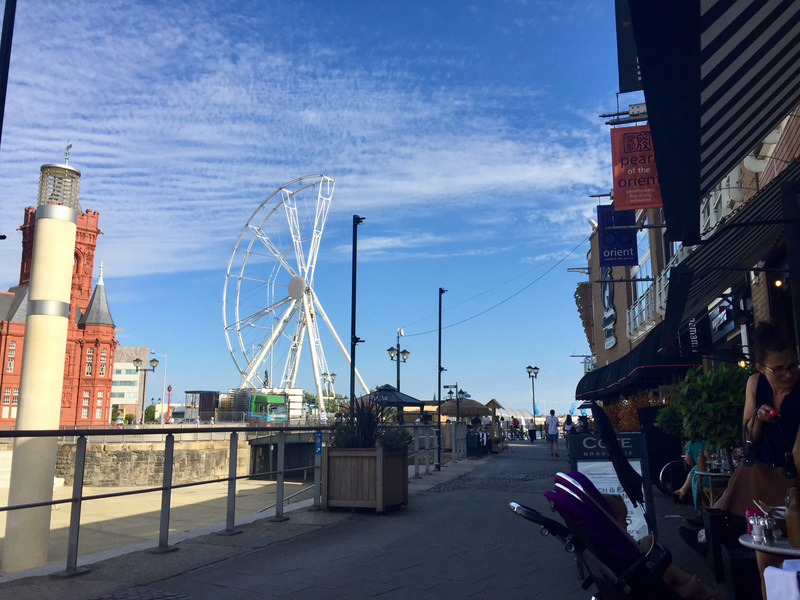 As it was a warm sunny evening, we chose to dine alfresco with views across to the Wales Millennium Centre. The bistro tables and chairs were just like those you see in France, all wicker chairs and marble top tables. 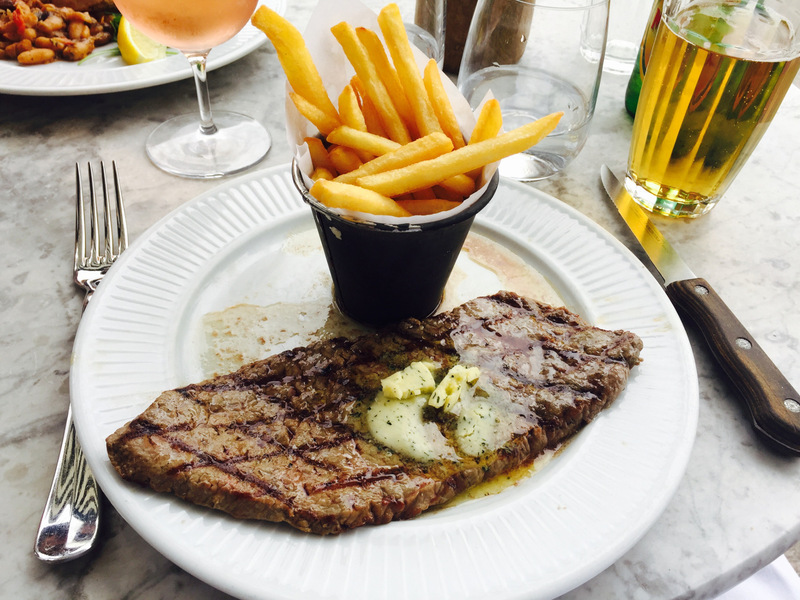 On the main menu expect to see French classics including steak frites, moules marinières and confit de canard. 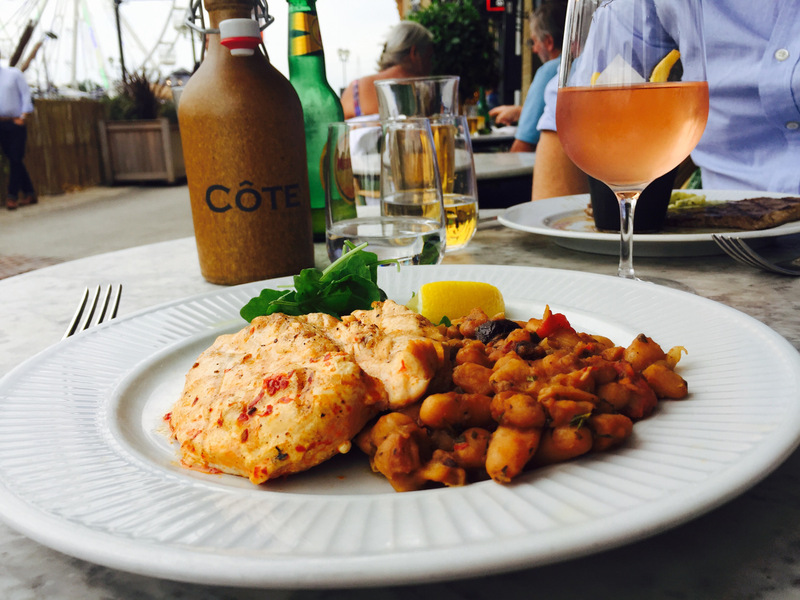 There is also an extensive wine list with reasonably priced wines starting at the £16 mark for a bottle of house red or white. On examining the wine list, the friendly waitress recommended the Chateau Gassier rose (£25.95) which was very quaffable and went down very well on a lovely summer’s day. We were also brought an earthenware complimentary bottle of filtered water without even asking which was a nice touch. At such excellent value we opted for the set menu. Between us for our starters we sampled the tomato salad, charcuterie plate and the tuna rillettes. 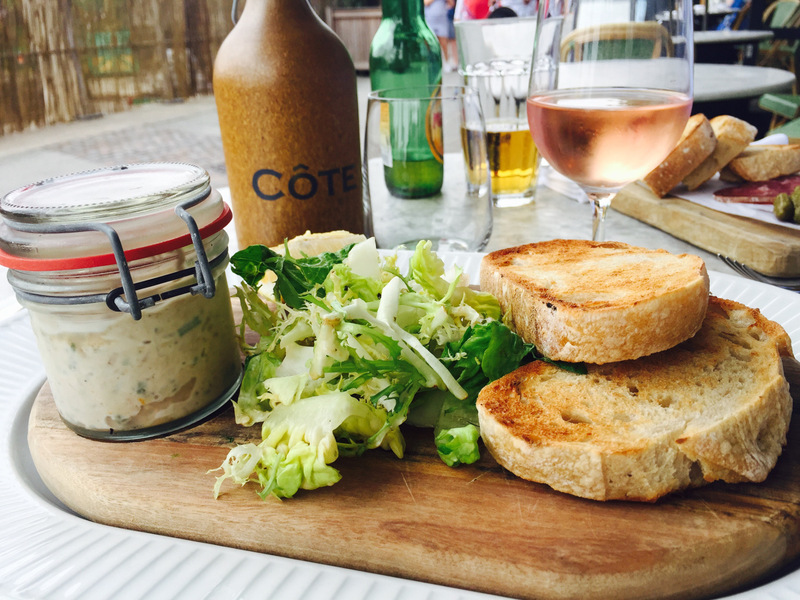 The tuna rillettes was yummy, it came in a little glass jar on a wooden board with some salad leaves and sourdough bread. It was well seasoned with lemon and herbs and had a nice crunch running through it from the spring onion and capers. It was delicious piled onto the slightly toasted sourdough bread. 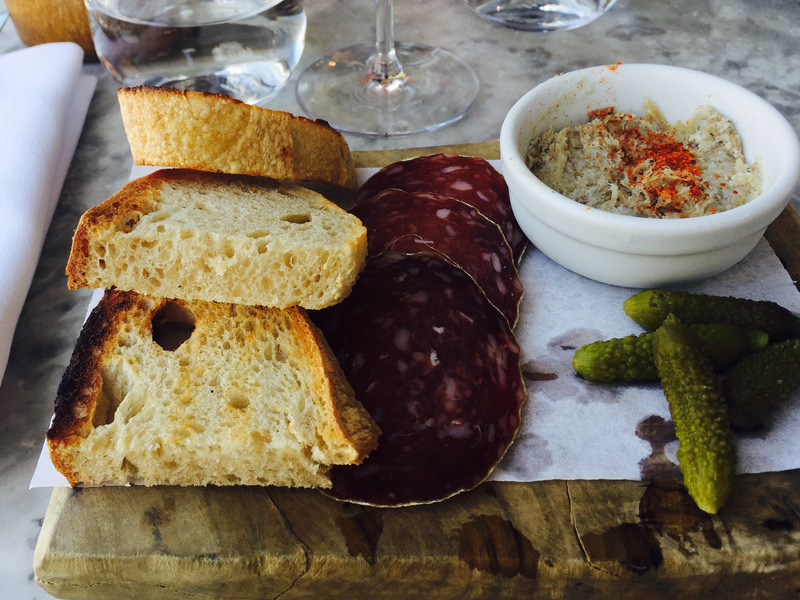 The charcuterie plate was well presented with some sliced saucisson sec and a delightful shredded pork pate. 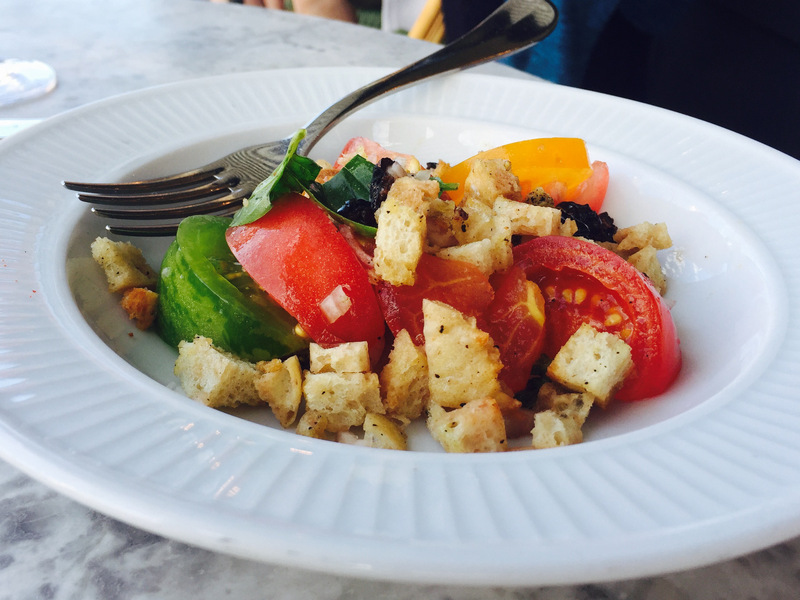 The salad, was just that, but with a tasty dressing. Our plates were cleared swiftly and it was not long before our mains arrived. They are clearly not in the habit of making you late for your theatre performance and are used to having to ensure a quick turnaround for those who need one. 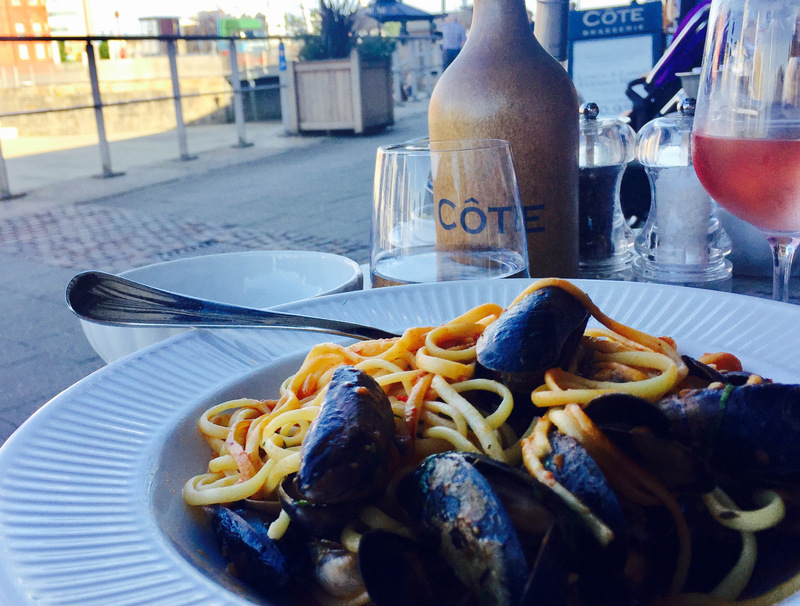 When it came, the seafood linguine was rammed with prawns, mussels and squid and my sister tucked in with gusto. The tomato and wine sauce was just as it should be quite light and not at all overpowering for the seafood. My piquant chicken was much tastier than it looked, tender succulent chicken accompanied by a warm bean salad which was packed with hearty flavour. The steak (£2 supplement) was suitably bashed thin and was covered in garlic butter, elevating an otherwise simple dish. The skinny cut French fries served in their little pot were perfectly crunchy. Only one of us opted for the desert, which was a deliciously rich and smooth chocolate mousse. 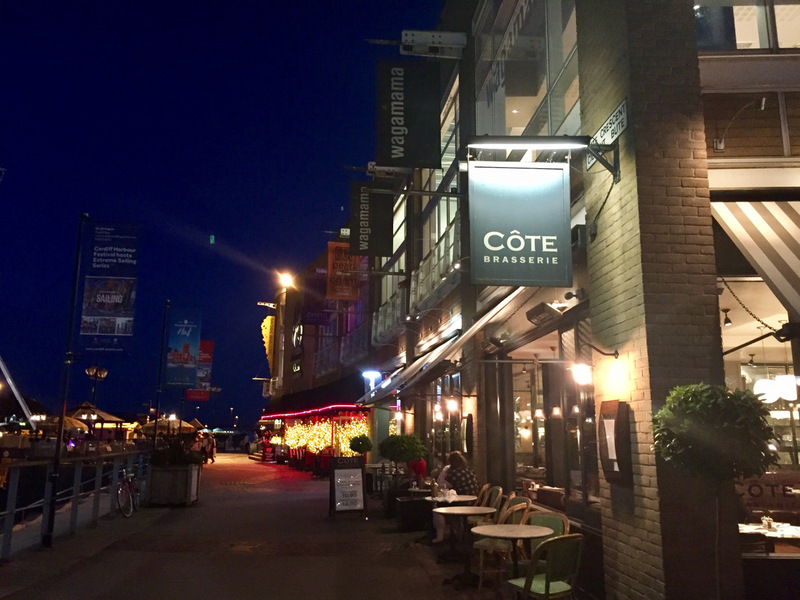 All in all, the combination of tasty freshly prepared food, excellent service, ideal setting and reasonable prices make Côte Brasserie the perfect choice for a pre-theatre bite.